Principal Bettye M. Adams of The Historic Samuel Coleridge-Taylor Elementary School, which is among Promise Heights' Community Schools, accepts a donation. Rite Aid Executive Vice President of Operations Bryan Everett, right, is shown with Baltimore City Councilman Eric Costello, center, and Catherine Pugh, state senator (40th District), behind Adams. 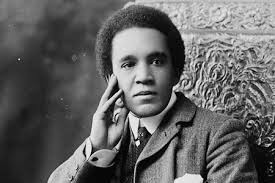 Samuel Coleridge-Taylor (1875-1912) is profiled at AfriClassical.com which features a comprehensive Works List and a Bibliography by Dr. Dominique-Rene de Lerma, www.CasaMusicaledeLerma.com. Partnerships are an integral part of how Promise Heights , an initiative led by the University of Maryland School of Social Work (SSW), improves the lives of Baltimore children. That was demonstrated once again when the Rite Aid Foundation donated $10,000 to a Promise Heights’ Community School upon reopening a riot-damaged pharmacy on Oct. 20. Fire had destroyed the Rite Aid store at 300 N. Martin Luther King Jr. Blvd., late last April during the unrest surrounding the death of Freddie Gray. Since May, the store had operated out of a trailer. Company officials chose the occasion of its celebratory reopening to make a gift to a nearby public school: The Historic Samuel Coleridge-Taylor Elementary School (HSCT). 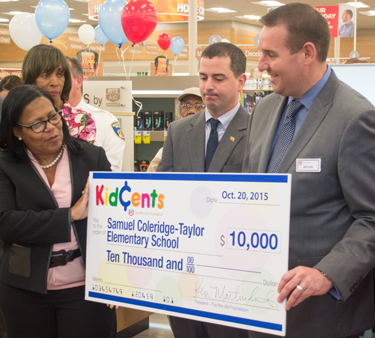 Principal Bettye M. Adams accepted a large replica of the check from Rite Aid officials. Bryan Everett, Rite Aid executive vice president for operations and Susan Henderson, senior vice president and chief communications officer, participated along with local elected officials. Adams noted that HSCT is historic in that it was established to educate African-American children. In preparing to make the gift, Rite Aid had approached officials at Baltimore City Public Schools, who suggested HSCT. The grant application for equipment to be used for intramural sports for boys and girls was prepared by Promise Heights program director Rachel Donegan, JD, and HSCT Community School coordinator Henriette Taylor, MSW, LGSW, both of the SSW. HSCT currently serves 407 students in pre-kindergarten through fifth grade from the neighborhood of Upton/Druid Heights, an impoverished area less than a mile from the rebuilt Rite Aid pharmacy. The store is located across the boulevard from the campus of the University of Maryland, Baltimore, whose professional schools are among Promise Heights’ partners. John Malveaux: "Lift Every Voice and Sing"